Just thirty years after Wheeler Bloomberg marked the opening of his famous two-story hotel and birthed of what is now downtown Ojai, this newest settlement in Ventura County was judged to have a sufficient population of Catholics to warrant mission status. Father Henry O’Reilly of Mission San Buenaventura was first to travel to Ojai to celebrate mass. 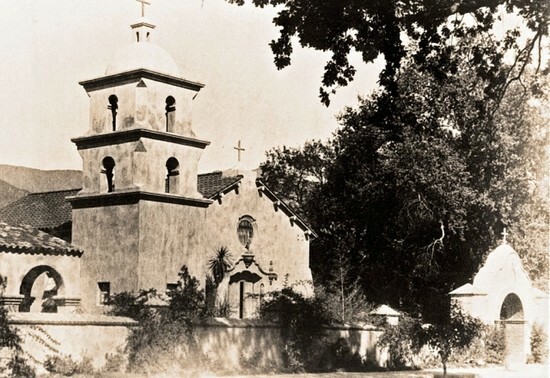 The following year, 1904, Father Gerald Gay of St. Sebastian’s Parish in Santa Paula inherited the responsibility for the Catholic faithful of the Ojai Valley. It was Fr. Gay’s successor Father Thomas King, who built the first Catholic church in the valley on land donated by Thomas Clark. This wooden structure, located on the corner of Blanche Street and Ojai Avenue in was then Nordhoff, served 15 families as well as a number of seasonal migrant workers. Fathers Henry O’Reilly, Eugene Sugranes, and John O’brien continued as part-time pastors until the appointment of Father Emil Ylla as the first full-time pastor in 1914. The great fire of 1917 burned down the wooden church and adjacent rectory as well as a good portion of the village of Nordhoff. For a year and a half the parish celebrated Mass at the Isis Theater located across the street from the church property. Edward Drummond Libbey, the Toledo financier of Libbey Glass fame, approached Father Ylla and offered his help in rebuilding the church. Libbey hired architects Frank Mead and Richard Requa to design a church a rectory in the Mission Revival style. It was the parishioners themselves who raised the money for the building, although Libbey later financed the landscaping as well as the wall surrounding the structure. The church was completed in 1918 and was dedicated on February 23, 1919 by the Most Reverend John J. Cantwell, Bishop of Los Angeles. It was this time the St. Thomas Aquinas Chuch was designated as an independent parish. The Reverend Fathers Killian, Verhallen, and Moclair succeeded in Father Ylla, shepherding the flock until 1924 when the parish of St. Thomas Aquinas was canonically entrusted to the Augustinian order as part of their agreement with the Diocese of Los Angeles and San Diego to found a Catholic boarding school for boys. Villanova Preparatory School, which admitted students this same year, became the center of parish activities. Until 1944, the pastor of the church served as headmaster of the school as well. In 1951, under the leadership of Father Phillip Holland, O.S.A., the rectory/parish hall was built; St. Thomas Aquinas Elementary School was constructed in 1955; the convent to the house the Sisters of Bethany was added in 1958. The center of church activities thus shifted from Villanova to downtown Ojai. By the 1950’s, the Catholic population in the Valley (700 families) had outgrown the little church. In 1958, therefore, Father Holland purchased ten acres of land in nearby Meiners Oaks on which to build a larger church. His successor, John F. Blethen, O.S.A. assumed responsibility for the building program. 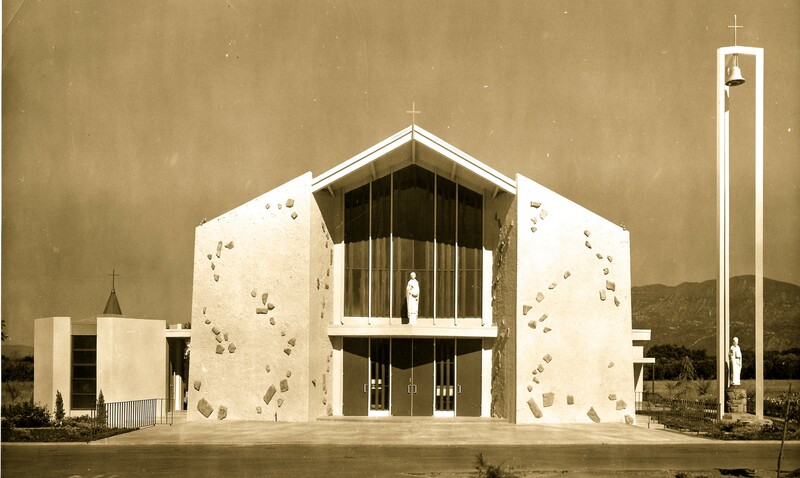 Ground was broken in 1962 and the new church, with a seating capacity of 700, was dedicated on August 25, 1963. The little church that had served the Catholic community of Ojai so well for half a century was known as St. Thomas Aquinas Chapel and remained so for thirty years until it was sold to the City of Ojai in October 1992 in an effort to consolidate all the parish buildings onto one campus. The final mass was celebrated in December the same year. Today the old chapel now houses the Ojai Valley Museum, Ojai Valley Historical Society, and the Ojai Valley Museum Research Library. Part of the money spent on the sale was used to fund the construction of a new parish hall, Aquinas Center, and religious education classrooms, Bethany Hall. Today our congregation has grown to more than 960 families under the leadership of our Pastor, Rev. Thomas Verber, O.S.A. and Associate Pastor, Rev. Fernando Lopez-Castillo, O.S.A.